Let's face it - sometimes we don't think about these kinds of things until it's too late. I've found in my experience that emergencies never seem to happen during 'regular business hours'. 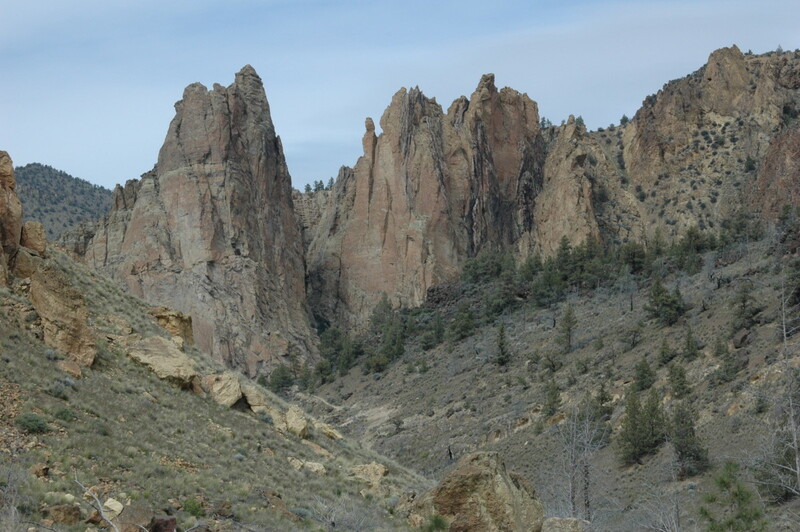 So what to do if you are out hiking late on a Saturday afternoon at Smith Rock and your dog gets bit by a rattlesnake and you haven't gotten your dog anti-venom shots? Or what if you step outside to say goodnight to your friends who are leaving at 11:00 p.m. after a nice dinner and cards - and your dog who happens to have his cloaking device on slips out the door beside you unaware, runs into the road just in time to get hit by a passing car? Unfortunately, life is full of things that just happen - both on a human and a canine level. The important thing I've found is to try and be as prepared as you can be. We are never altogether prepared but at least if you know where emergency vet services are available in Central Oregon, you have a chance to get your pet the best care as quickly as possible. What Constitutes a Vet Emergency? Of course this will vary from pet to pet - and most vets nowadays service a wide range of animals such as dogs, cats, birds, reptiles and rodents such as ferrets - even llamas and alpacas. And if you live in Central Oregon, most vets also have experience with cattle, pigs and horses. I am a dog person and thus I tend to always use dogs as an example. However, most of this information relates to all animals but for simplicity, I will keep it to dogs! How Do I Know My Pet Needs Emergency Treatment? I believe in being safe rather than sorry so if in doubt, calling a vet would always be the wisest choice. I have had to take several of my dogs in as emergencies and several times those dogs did not survive. 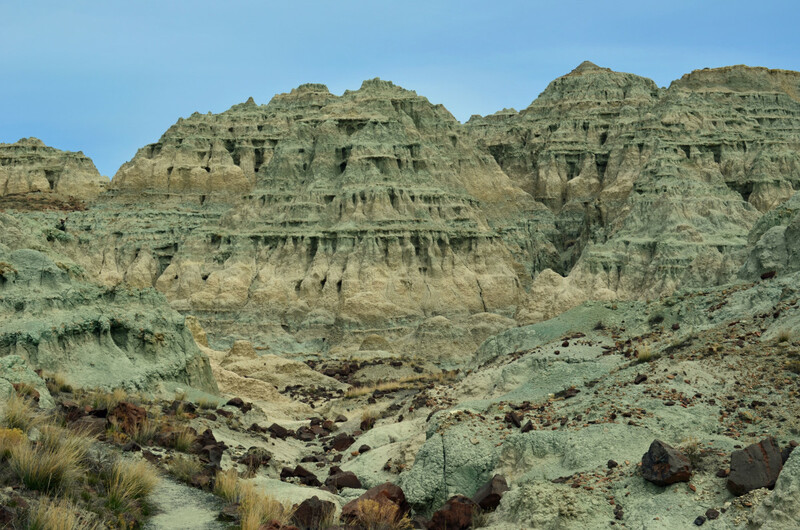 In those cases, however, it was a case of the dogs being too old and the damage too severe. One of my dogs got bloat and it was the second time. She was almost 14 and the vet felt she could not survive the surgery. An old dog at about age 17 just collapsed and couldn't move - he apparently had a stroke. We wrapped him in a blanket and carried him to the vet. Unfortunately, there was nothing they could do to save him at that point. After spaying one of our dogs, she developed a raging infection after the surgery. She became listless and lethargic and by the time we got her to the vet, she had spiked a super high fever. Fortunately, they got it down and she survived. We had a dog with a cone on her head because she had a hot spot and would not leave it alone. She somehow hit one of our other dogs with the cone in the eye. This caused the eye to be so scratched that the inside protective lid came down over the eye and we had no idea what was wrong. It looked grotesque and we thought it had damaged his eye permanently. We took him to emergency and they were able to fix the temporary lid and give medicines to soothe the scratched eye. One of our dogs was in a fight and the other dog bit his leg so badly that the tendon was exposed. He couldn't even put weight on it. Emergency vet services sewed him up and got him back to normal. Another older dog woke up one day and just couldn't stand and walk straight. She could walk but would fall back down. We thought she had had a stroke but it turned out she had vertigo and a neurological condition which was temporary - both treatable conditions. That said, I always try and call my vet and ask what I should do. Usually vets have an answering service and if they are not available, most often there is an on-call vet that can answer the burning question - 'Should I bring my dog in right now somewhere or should I wait until morning?' By listening to the symptoms or circumstances, they can give you some idea of what the problem could be - although bear in mind over-the-phone diagnosis is not always possible. If you don't have a vet available that you can call after hours, or for instance if you are traveling, look under veterinary clinics and try to find one that advertises availability 24 hours a day. My dogs were sprayed by a skunk. Almost immediately, one of them seemed to react - he just became 'sick' and lethargic. He was sprayed in the face and the vet thought probably it was a reaction to a close range shot to the face. He did tell us what to do to clean them up and what would make him more comfortable - also what signs to watch for. The dog was fine after a day or so and we didn't have to make a trip in to the vet. Porcupine quills - It rather depends on how badly they were 'sprayed' with quills and where - and if you know that you can safely remove them. It can be questionable whether it's an emergency. It again depends on where the quills ended up. Waiting in some cases can be hazardous in the event that the pet bothers the quills or any get into eyes, mouth or ears. There are recommended ways of removing the quills but make sure you know what you're doing or have a professional do it. Parts of the quill can remain lodged which can lead to infection. Again, calling in might save you and your pet grief down the road. In both these cases, you have to decide if treatment can wait until morning or even if it is needed at all. Is it mandatory that you get the animal treatment right away or if you can handle it yourself? I've found that that's what vets are there for - advice and treatment! Check out the video on what signs to look for to determine if your pet needs emergency treatment. Okay - I Know I Need Emergency Treatment - Where Do I Go? Once you've determined that your pet does need emergency treatment, here are some options. I like to have a knowledge base before things happen so hopefully these facilities will be of use in determining who you can call. These are clinics in different cities of Central Oregon but a nice geographical spread. Use your best judgment on who you could call and then who you could get your pet to quickly if it's an emergency. Fee for examination is $95. You will be provided with a written estimate of the total cost of care in terms of tests or procedures. 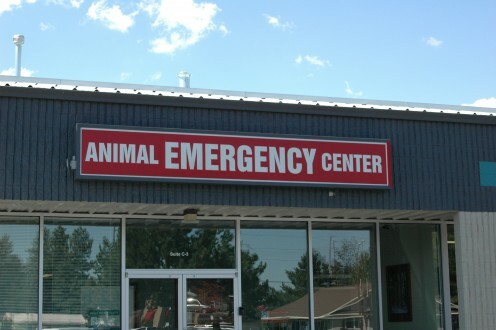 The Animal Emergency Center takes Visa, Mastercard, check, cash or CareCredit (a credit card program for paying vet bills over time but as needed). 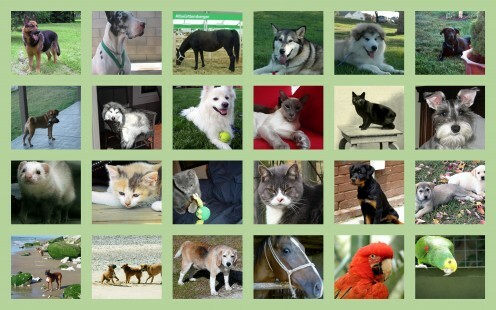 Animal Emergency Center is open Weekdays 5:00 p.m. to 8:00 a.m. and 24 hours per day on weekends and holidays. Redmond Veterinary Clinic has been in business serving Central Oregon since 1942. The library of useful information that they have on-line is impressive and you can learn much in the way of preventative medicine for your pets as well as learn helpful hints for common maladies - or just read up on pet care in general. Though cats and dogs are the usual pets we think of, Redmond Veterinary Clinic has expertise with dogs and cats as well as horses, cattle, llamas and alpacas. There is a vet on call 24 hours per day 7 days per week at Redmond Veterinary Clinic and if you call the number listed below, you will get in touch with a vet and be instructed on how to proceed. Redmond Veterinary Clinic offers a full plate of services for emergency pet care and they have the facilities to perform x-rays, run tests, perform surgery and administer necessary fluids and medicines. You can pay for services at Redmond Veterinary Clinic several ways: Standard credit cards such as Visa and Mastercard, American Express. You can also pay by check or with cash. You can also pay by EasiPay which is a service through Redmond Veterinary Clinic where the bill is divided into 3 monthly payments after a deposit is made. You would be required to pay the deposit before taking the pet home and then you are billed for 3 equal monthly bills to pay off the rest with a 1.5% service charge. Also available is CareCredit which is an on-demand credit card - you use it when you need it and then pay it off. They also have several health insurance plans for the interested pet owner. 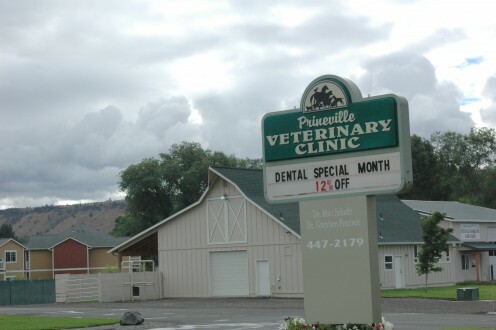 Prineville Veterinary Clinic has been our vet for the past 6+ years since moving here to Central Oregon. If you are looking for emergency vet services and you are in the Prineville area, this is who you want to call. This veterinary clinic is top of the line when it comes to knowledge base and care. When one of our malamutes became strangely sick 6 years ago, our vet was able to diagnose him with Addison's disease where everyone else was stumped. A disease that should have killed him after a year or two ended up staying in remission and gave him 5 more good years of quality life. Prineville Veterinary Clinic is equipped to do surgery and x-rays. They can also set broken bones and are fully prepared with anti-venom as well. 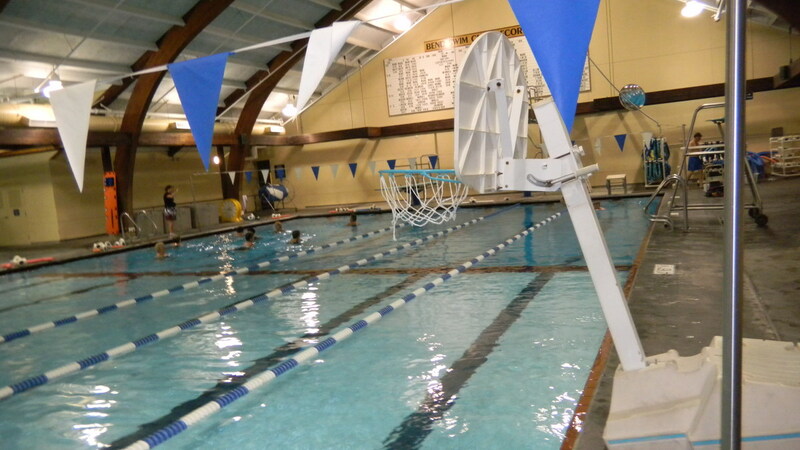 They offer a variety of prevention programs and such programs as shown on the sign - dental health discounts, wellness exam discounts and even senior discounts. Prineville Vet Clinic believes that pets are more like family members - or at least that seems to be the feeling in this part of the country. They treat each animal to the best of their ability and with compassion. However, they also know when to tell you that there is nothing more that can be done and when it's time to think about euthanasia. Check their website for fabulous information on all kinds of pet problems, weight reduction suggestions, and general maintenance for pets. There is so much information there that it may keep you busy for a while. Prineville Veterinary Clinic also offers boarding and pet sitting during the day. I have a friend whose golden retriever got into something and was showing all the signs and symptoms of poisoning. Our vet met her at the clinic and the dog received excellent care and was as good as new by the next day. 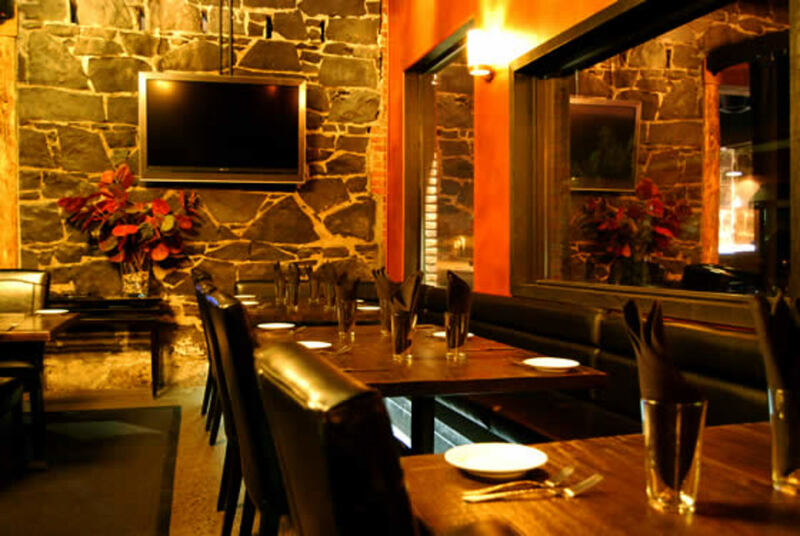 Credit cards are accepted, as are checks or cash. You can also use CareCredit at Prineville Vet Clinic when the unexpected bill happens. For emergencies, simply call the clinic's number and someone will meet you at the clinic or advise you on what to do. 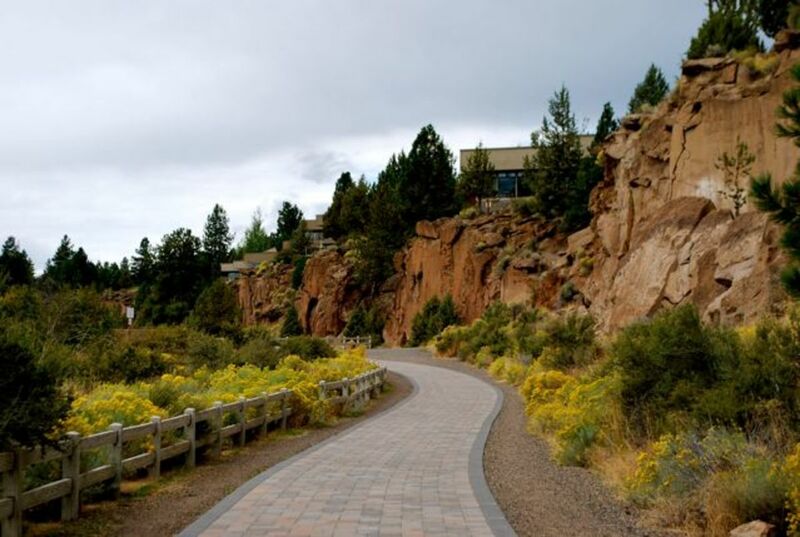 In short, there are several options depending on what part of Central Oregon you are in since the region encompasses about a 45-minute radius either way from Bend. Sometimes, time is of the essence and if you have the information available, you'll probably be in a better position to get emergency care according to where you are in Central Oregon. Sometimes planning ahead and knowing what your plan of action will be is also a good idea. Much as with children, we cannot always foresee what our pets will get into or what will happen. The old saying is true - an ounce of prevention is worth a pound of cure. Knowing where you will be able to seek help is a good idea and I like to think having the information at hand will help me save time and get help for my pet if needed. We all hate to think of needing emergency vet care, but sometimes it just happens. These vet clinics though are experts at emergency care and understanding what needs to be done and also what can be done. List of supplies to have on hand in a disaster survival kit in case of an emergency and tips to help you prepare for the worst possible scenario. BJ - Definitely - seek emergency vet services right away - and if she appears to deflate like a balloon and start flying about the room or the barn whichever place her ballet performances are held - this is totally normal. No worries - she will be back to herself if not better after the expulsion of all that hot air....much like myself! Thanks for the read! Katie - thanks so much - emergencies are not my cup of tea but having been through a few too many, I guess I am becoming an 'expert' - ouch! Thanks for the read! Pamela - Thanks so much!! Simone - You are making me blush - but thanks so much for the compliments. I believe our pets deserve our kindest regards and that we should do all we can to just keep 'em safe for as long as they grace our lives. Nell - I hate the down sides as I am way too sensitive for my own good. I have never looked at my pets as 'just a dog' or a cat when I had cats. My downfall so I guess I err on the side of crazy in trying to protect them at all costs! Thanks so much for the read!!! akirchner, you're absolutely right that we don't think of such things as pet emergencies before they happen- who would want to! For those who avoid doing the research ahead of time, your guide will prove to be a real (and I am sure sometimes literal) life-saver. For those who plan ahead of time, this guide will serve as a comfort and great convenience, for you've done all the legwork! Thanks for composing this hub. What a fantastic resource! Great hub if you need emergency treatment for your pets. Congrats on your nomination. Good grief girl what to do in an emergency situation with your pets because you just don't know what can happen. I'm really impressed with this hub. According to this hub, you appear to be well versed in considerable calamitous canine catastrophes. Is your porcine perspicacity prodigious perhaps also? I need help. My pet pig perspires profusely particularly preceding performances. She is a ballet dancer. Do you think her tulle tutu's too tight? We await your considered response. HH - Thanks so much for the read and for the compliment! Steph - Holy cow - that is amazing. That's like my Molly with the vertigo and neurological thing. I was sure I was going to have to say goodbye to her that day but they were so cool. Gave her another year almost. I love the name Garrett by the way - that is my son's middle name! Great idea for a hub! We've taken our bigger dog to the Animal Emergency Center in Bend when he had a seizure that lasted nearly 2 hours. Not a fun situation and we thought we were going to have to put our pet down. But they were sooo helpful and great. We still have Garrett thanks to their attentive, personal service. Thumbs up as usual! A very good idea to give this useful advice. Super hub. Thanks, Laurel - I think been there and done that is the only reason I know these folks really do care and try to do the best by pets. Now that you've convinced me to visit Central Oregon, I will rest assured Ranger will be in good hands, if necessary.